McLaren has removed the shape-changing, additional body panels previously used to hide the form of its imminent, rule-breaking "Grand Tourer". The car’s sleek and boldly elegant design can now be discerned although the lightweight body remains covered by a shrink-wrapped livery that suggests the number of established rules the McLaren of Grand Tourers will break. The company is promising it will begin to peel off this disguise this May. The application of the shrink-wrap will also enable the Development Team to enter the closing stages of the car’s extensive evaluation programme, which has already encompassed thousands of miles in hot and cold climates across the globe. The "Grand Tourer" has proven its ability to cover long distances in supreme comfort, but always with extra shape-changing and noise-inducing panels applied. Now that these have been removed, the Development Team will run further validation tests, including a 1,600 km drive from McLaren’s development base near Barcelona, Spain, back to the McLaren Technology Centre in Woking, England. 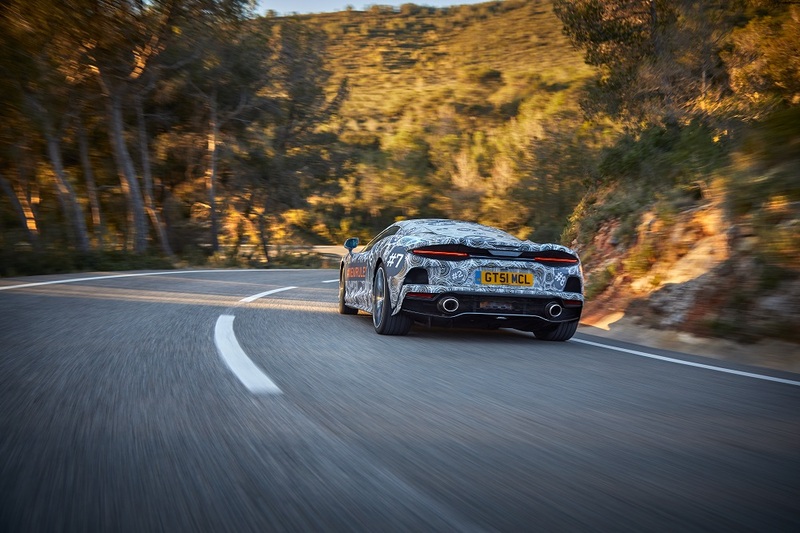 To be completed in one stint with two occupants and a full complement of luggage, this is one of many long-distance drives that will help the team to confirm the new model is both comfortable and refined over the long distances a grand tourer is expected to consume… one rule that McLaren won’t be breaking. The McLaren of Grand Tourers was announced by McLaren Automotive CEO, Mike Flewitt, during last month’s press presentation at the 89th Geneva Motor Show. He promised that the fourth car to be launched under the company’s Track25 Business Plan will combine competition levels of performance from a twin-turbo V8 engine with continent-crossing capability and a level of agility never experienced before in the luxury Grand Tourer segment. He stated that the McLaren of Grand Tourers will be the most usable mid-engined car yet. The McLaren of Grand Tourers will also be the only one to share its DNA with a Hyper-GT: McLaren’s Speedtail. Mike went on to say that the car - a name is yet to be announced - won’t be part of any of the company’s existing model Series and will be a unique, tailored model. Its interior will feel spacious, uncluttered and modern with only authentic, high quality materials employed.